Share files with other Bluetooth devices with the D-Link Wireless Bluetooth 2.0 USB Adapter. The DBT-122 offers hassle-free connections between your computer and Bluetooth devices, providing the perfect solution for home and business users alike. Experience the world of Bluetooth technology with the D-Link Wireless Bluetooth 2.0 USB Adapter (DBT-122). Sync your PDA and download images from your Bluetooth camera from across the room or transfer music from your PC to your mobile phone from down the hall. Connect headphones, mice, keyboards, and other Bluetooth devices to your computer with the convenience of Bluetooth wireless technology1. The Wireless Bluetooth 2.0 USB Adapter was designed and engineered with mobile users in mind, making it a perfect solution for use with notebook computers. Ultra-compact and portable, utilize the device on trips, at work, school, coffee shops, or anywhere around the house for an instant, untethered connection. The DBT-122 is compatible with Windows® XP/2000 and Mac OS® X2 and works with desktop or notebook computers with an available USB 2.0/1.1 port3. To keep your data safe and secure, the DBT-122 utilizes 128-bit encryption and Adaptive Frequency-Hopping (AFH). Both notebook and desktop computer users will experience seamless connectivity with the D-Link Wireless Bluetooth 2.0 USB Adapter (DBT-122). 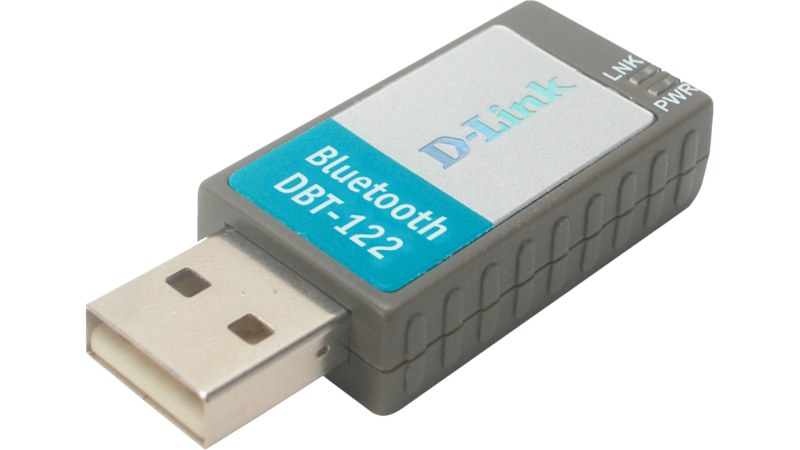 The DBT-122 offers hassle-free connections between your computer and Bluetooth devices, providing the perfect solution for home and business users alike. The Wireless Bluetooth 2.0 USB Adapter allows you to share files with other Bluetooth devices and synchronize your computer and handheld device with the click of a button. Update your calendar and contact list, instantly transfer songs and photos, and utilize a Bluetooth keyboard and mouse with the convenient Wireless Bluetooth 2.0 USB Adapter. Set up your new D-Link Bluetooth device in minutes using our new Quick Setup Wizard. The wizard will guide you through an easy to follow process to enable Bluetooth connectivity to your network. If you need additional help, visit D-Link’s award-winning Customer Support Web Site for answers to frequently asked questions, product downloads, and easy access to D-Link’s friendly customer support team. 1 This device supports Bluetooth® Version 2.0 from hardware version C1. However D-Link cannot guarantee full compatibility with all devices due to modifications and/or other variations of the devices’ implementation of the Bluetooth 2.0/1.2/1.1 standard. 2 MAC OS X v.10.4.3 or higher required. 3 Using a USB 1.1 port will affect device performance.